In a blow to Spanish unity, Catalan separatists keep the majority in regional vote: NYT reports, separatist parties won a narrow majority in Catalonia after the Spanish government called the election in an attempt to resolve the constitutional crisis. Catalonia results: Parties seeking to secede from Spain narrowly won a snap election. The separatists won about 47 percent of the votes but secured 70 of the 135 seats in the regional Parliament, a narrow majority. Catalans really, and still, want to be free, while at the same time, Catalan's independence is less than clear and easy. "The idea that China Correspondents Lisa Murray and Angus Grigg were merely journalists, chasing stories and looking to generate clicks seemed implausible to their Chinese minders." An excellent read to grasp how the Chinese Communist Party seeks to control and gather information. Boris Johnson faces cold reception on Russia trip: FT reports, relations at ‘zero-level’ for first visit by foreign secretary in five years. Theresa May says she wants to see a female James Bond. Cuba: Raúl Castro will step down as president in April. Make plans to attend the NEXT CHINA conference hosted by SupChina. The event will be held on Wednesday, January 17, 2018, at The Times Center in New York City. The conference will have five sessions covering Technology, Economy, Healthcare, Politics, and Philanthropy, followed by a live Sinica Podcast recording on “Cracking the China Conundrum." Use code HOLIDAY for a $300 ticket. Dispute over political strategy erupts inside the White House: NYT reports, an Oval Office meeting involving President Trump and his top advisers on Wednesday devolved into a heated exchange between his former campaign manager and the White House political director, people briefed on the discussion said. Republicans warn Trump of 2018 bloodbath: Politico reports, the White House knows the midterm election will probably be bad. Behind the scenes, top aides are scrambling to avoid the worst. US government funding has been extended until January 19. Bots will sway an election near you: Bloomberg reports, the key to political victory may lie in code. Automated software, known as bots, can fire out non-stop social media messages backing a particular candidate or campaign. The phenomenon goes beyond Russian-linked Facebook accounts aiming to influence foreign elections. Researchers in the and US found Twitter bots weighing in on Brexit and the US vote. Boeing is seeking to buy the Brazilian aircraft maker Embraer to try to gain a bigger foothold in the regional jet market. Eric Schmidt steps down as executive chairman of Google's parent, Alphabet. Facebook signed a deal with Universal Music Group that lets its platforms carry songs from the music label’s artists. Qualcomm has gotten a permit to test self-driving cars on public roads in California. Daimler buys France’s alternative to Uber: FT reports, the deal for Chauffeur Privé shows German group seeking to attract vehicle-less consumers. Volvo, Cadillac, and Porsche drive subscription model growth: FT reports, carmakers are launching rental services even as peer-to-peer car lending platforms gain traction. Catalan votes today: Catalans are casting their ballots in a regional vote that could determine whether the threat of secession by the wealthy region continues to loom over Spain or if separatists’ push for unilateral independence has peaked. EU prepares a Canada-style Brexit deal for UK: FT reports, bloc to make the limited-access trade offer if Britain fails to clarify demands before summer. 23 percent = The percentage of the total supply Bitcoins which is believed to be lost, locked behind forgotten passwords or hidden in misplaced drives. US creating 'sensational hype' over China's military modernization: Reuters reports, the United States has created "sensational hype" over China's military modernization, the defense ministry has said in reaction to a White House report branding China a competitor seeking to challenge U.S. power. Wait until Trump hears about this - oh boy. GOP tax vote seals victory for Trump: WSJ reports, Congress gave final approval Wednesday to a $1.5 trillion tax cut, delivering a major victory for President Donald Trump and GOP leaders after nearly a year in political control of the capital. Should he decide to run for re-election, Trump will have a less than pleasant experience and won't find the campaign trail of 2016 in 2020. Senator Franken to leave the US Senate on January 2. Virginia house race is tied after court ruling: WSJ reports, It’s not over yet in the Virginia House of Delegates race that threatened to strip Republicans of their majority. A Wednesday decision by a three-judge panel to count a disputed ballot made the race for a House seat representing Newport News a tie. The ruling came a day after an elections panel had ruled for the Democratic challenger in a recount of the November vote. "House District 94 seat could be determined by drawing lots"
A reminder that every vote counts, but so does a solid election law team and the judicial system. The slow death of the American mall: WSJ reports, the rise of online retail and changing consumer preferences have hammered US shopping malls since their heyday in the 1990s. Many of these former engines of commerce and centers of community life are now mere skeletons as they fight for their lives. Didi Chuxing raises $4 billion in new funding placing the ride-sharing platform with a valuation of more than $50 billion. Penske Media has acquired a controlling stake in Wenner Media, whose prime asset is Rolling Stone magazine. The rise of the all-day menu: Look for more restaurants where mealtimes are mutable and noshing is the new dining with fewer power lunches and formal meals. Lady Gaga will reportedly set up a residency at the MGM Park Theater in Las Vegas. Mortality in the United States declines: CDC reports, In 2016, life expectancy at birth was 78.6 years for the total US population—a decrease of 0.1 year from 78.7 in 2015. For males, life expectancy changed from 76.3 in 2015 to 76.1 in 2016—a decrease of 0.2 year. For females, life expectancy remained the same at 81.1. Nashville awarded MLS expansion club. One of the eight candidates will be chosen at the organization's annual meeting in February, in Orlando. India is unequal: The top 10% in India take home 55% of the country’s income. Japan is building missile bases to confront rising threat from China: WSJ reports, Japan’s military is laying the groundwork for batteries of anti-ship and anti-aircraft missiles in a quiet, sugar-cane-filled valley in its southwestern island chain, as it girds to confront what Tokyo views as its greatest long-term threat: China. China's embassy in Canberra has taken the rare step of issuing a public safety warning for Chinese students living in Australia due to "a rising number of insulting incidents". "The Chinese government has been using proxies in Australia for years to polish its image and press for its priorities, including reunification with Taiwan and sovereignty over the South China Sea. These efforts have intensified under President Xi Jinping, who seems to view Australia — which has benefited greatly from trade with China — as a laboratory for efforts to sway opinion abroad and increase China’s global influence." Twelve days in Xinjiang: How China’s surveillance state overwhelms daily life: WSJ reports, China’s government has turned the northwestern region into a laboratory for high-tech social controls. Citizens and visitors must run a daily gantlet of police checkpoints, surveillance cameras and machines scanning their ID cards, faces, eyeballs and sometimes entire bodies. North Korean cyberheists fan fears amid bitcoin frenzy: Nikkei reports, US points to Pyongyang as the culprit behind WannaCry attacks. Catalonia votes again, this time in a gamble to stall its secessionists: NYT reports, after Catalonia declared independence two months ago, Prime Minister Mariano Rajoy of Spain took extraordinary control of the region and called elections, gambling that voters would punish the separatists who had propelled the nation’s worst constitutional crisis in decades. That election now comes Thursday, but far from solving the conflict, it could just as easily complicate the task of governing the first of Spain’s 19 regions to have its autonomy stripped, placing the country in uncharted political terrain. Catalonia in turmoil: Bloomberg reports, while Spanish Prime Minister Mariano Rajoy sought to halt political chaos in Catalonia by forcing a snap election, the result of Thursday’s vote there may kick off a new phase of upheaval. With no clear winner and mutual resentment increasing, separatists from Edinburgh to Venice are watching closely. Madrid believes Catalonia independence threat is over: FT reports, the Spanish national government still faces enormous difficulties in the region, analysts say. Norway is to become the first Scandinavian country to decriminalize drugs as it focuses on treatment rather than punishment. 2020: The EU expects the U.K.’s post-Brexit transition period to last until the end of 2020 and is aiming for a trade deal to kick in immediately after that, according to a European Commission official. The EU wants a transition period after Brexit to end no later than the last day of 2020, according to the European Commission's negotiating directives agreed on Wednesday. Trump's London visit still uncertain after call with May as tensions continue: Guardian reports, Theresa May spoke to Donald Trump on Tuesday about their country’s very different positions on Jerusalem, but it was left unclear whether previous damage to the relationship had been repaired – or whether the president would visit London in February to open the new US embassy. The Daily Mail is reporting Trump plans to visit Britain in February to open the new US embassy in London but will not meet Queen Elizabeth. Donald Trump’s first visit to UK ‘to be announced soon’: The Times reports, details of Trump’s first official visit to the UK will be announced soon, the White House has said. The statement from the US president’s office will strengthen expectations that Mr Trump will dedicate the new US Embassy in London in February. The “working visit”, which is not expected to include a meeting with the Queen, was proposed after controversy around the UK’s offer of a state visit in January. "(New voters are) a member of an Italian generation that has known only economic stagnation, and which will head to the ballot box for the first time in a general election next spring. They were born around the same time as the euro — 1999 — and are now old enough to vote. They’ve seen nothing but political and economic crises since their childhoods, and politicians apparently unable to fix them." Russia: say 2018, think 2024: To divert attention from growing economic frustrations, Putin in the coming six years must maintain popular belief in the “siege mentality” narrative – the idea of a salient threat from the West that seeks to destabilize Russia’s national security at any moment. Canadian executives push Trudeau to join new US-free Trans-Pacific Partnership: BNN reports, more than a dozen top business leaders are telling Justin Trudeau it's time for Canada to immediately join the revamped Trans-Pacific Partnership that no longer includes the United States. An open letter to the prime minister from 18 chief executives comes after last month's decision by Canada to withhold support from what appeared to be a breakthrough agreement by the 11 remaining TPP countries to sign a newly-configured version of the Pacific Rim trade pact. Trump is a gift to Trudeau. He makes Trudeau look good: Trump may be a blight on his country and a bane to civilized behavior, but for Trudeau, he could prove to be a considerable asset when the next election comes. The Senate passed the tax-overhaul bill, 51-48, putting Congress on the cusp of passing a $1.5 trillion tax cut and the largest structural overhaul of the tax system since 1986. The measure will return to the House for a final vote on this morning followed by a White House presser expected around 1:00 pm ET. This is the best day of the Trump administration so far - he best enjoy this moment because 2018 is the year of the dog. Every vote counts: A Democrat in Virginia defeated a Republican incumbent by a single vote — 11,608 to 11,607 — leaving the House of Delegates evenly split between the two parties. 8,500 firefighters = The number of firefighters who have battled the Thomas wildfire in Southern California — the largest mobilization to fight a wildfire in California's history. The effort has cost $130 million and forced 104,607 people to leave their homes. Microsoft's worldwide "advertising expense" for its fiscal year ending June 30 totaled $1.5 billion. United Parcel Service said it is buying 125 Tesla all-electric semi-trucks. Uber dealt a blow as EU court rules it is a transport firm: WSJ reports, Uber suffered a major defeat in its effort to overturn strict rules and licensing requirements in Europe, after the bloc’s highest court ruled the ride-hailing company should be regulated as a transportation service, rather than a digital service. Uber is a taxi service, the ECJ says, in a major setback to the firm: NYT reports, the decision by the European Court of Justice found that Uber operates more like a transportation service than an online platform that matches passengers with drivers. It is likely to restrict the company from expanding services that allowed nonprofessional drivers to offer rides to clients. Paris’s colette, ‘trendiest store in the world’, bids adieu after 20 years: AFP reports, located on rue Saint-Honoré in the 1st arrondissement (district), right in the beating heart of Paris, colette -- the brand's name deliberately spelled in lowercase -- became a “must-visit” for anyone seeking to put their finger on the Parisian trend-setting pulse. It drew crowds from all over the world, including celebrities like Rihanna, Pharrell and Zlatan, who came to experience its unique universe of blending fashion, street art, beauty products, jewelry and high-tech gadgets under the same roof, not to mention its famous water bar which contains some 80 different varieties of the blue stuff. The Lakers have retired both of Kobe Bryant’s jerseys — No. 8 and No. 24. "Beijing accused of pursuing policies of economic aggression to weaken US"
Trump’s national security focus shifts to Russia, China: WSJ reports, Trump will put his domestic economic and trade policies at the heart of a new national-security strategy that depicts the world as one of the heightened rivalries and potentially dangerous competition. National security plan hints at return to Cold War footing: NYT reports, Trump’s first national security strategy, which envisions rivalries with China and Russia, is at odds with his often-warm relations with the leaders of those two countries. New national security plan paints China and Russia as US competitors that want to realign global power in their interests: WP reports, Trump will present the strategy, which follows his “America First” doctrine, in a speech today. An official said the plan does not expressly “overturn” strategies of former president Barack Obama or his predecessors, but it frames Trump’s priorities differently. Trump targets China and Russia on national security: Reuters reports, Trump will declare that China and Russia are competitors seeking to challenge U.S. power and erode its security and prosperity, in a national security strategy he will lay out today. The speech will take place at 2:00 pm ET from the Ronald Reagan Building and International Trade Center. Sebastián Piñera wins the presidential election in Chile: WSJ reports, the billionaire who had already served once as head of state cruised to victory, promising to reinvigorate the country’s flagging economy after four years of subpar growth. Chile swings right to return Piñera to the presidency: FT reports, billionaire ex-leader joins Argentina’s Macri as another businessman-turned-president. Honduran president declared winner, but OAS calls for new election: NYT reports, the Honduran electoral commission on Sunday declared President Juan Orlando Hernández the victor in a bitterly contested race, but the Organization of American States called for a new election, arguing that the vote was so riddled with irregularities that it was impossible to be sure of a winner. The electoral commission, which is controlled by allies of Mr. Hernández, said he had won by about 50,000 votes over the opposition candidate, Salvador Nasralla. GOP faces a five-day sprint to pass its tax bill, forge a deal with Democrats to avoid a shutdown: WP reports, Republicans plan to vote on the tax bill early in the week, leaving them little time to strike a deal with Democrats to authorize funds to keep the government running. Suburbs offer Democrats a path to House control: NYT reports, from Houston to Seattle, suburban districts once locked down by Republicans are looking to Democratic candidates to oppose President Trump. If you a Republican MOC and there is a Whole Foods in your district - bye, Felicia. The Thomas fire in Santa Barbara and Ventura counties has grown to be the third-largest wildfire in modern California history. Tencent teams up with JD.com to take on Alibaba: WSJ reports, in an escalating battle between China’s dominant internet giants, Tencent has teamed up with JD.com, Alibaba’s main e-commerce competitor, to buy a stake in the No. 3 online retail player. Hershey to buy Amplify Snack in $1.6 billion bet on healthy snacks. Campbell Soup Co. will buy Pretzels and Cape Cod chips maker Snyder‘s-Lance Inc for $4.87 billion as it looks to expand its snack business amid sagging soup sales. Toyota to market over 10 battery EV models in early 2020s: Reuters reports, Toyota Motor Corp said it would market more than 10 all-electric vehicle (EV) models globally in the early 2020s, a target which could require the firm to look beyond a partnership with Panasonic Corp to co-develop and supply batteries. Star Wars: The Last Jedi'opens with $220 million box office weekend - the second best weekend all-time. I saw the Darkest Hour this weekend and can report that Gary Oldman was sensational. Mount Everest: About 5,000 people have reached the top of the mountain since the feat was first accomplished in 1953, and nearly 300 people have died in the attempt. ✔️ Paul D. Ryan exiting as speaker? World trade order in a wobble as Washington snubs WTO status quo: Reuters reports, the frustration of Roberto Azevedo was evident when, as director general of the World Trade Organization, he summed up the results of a three-day ministerial conference in Buenos Aires in the past week. There were simply none. China set for slower growth target in 2018: Caixin reports, key policymaking meeting likely to focus on curbing financial risks, reining in debt. Chinese authorities collecting DNA from all residents of Xinjiang: Guardian reports, officials build a database of iris scans and blood types of everyone aged 12 to 65 in the region home to 11 million Muslim Uighurs. How's the soft power campaign working? South Korea outraged by journalist beating in China: AFP reports, South Korean news media on Friday expressed anger and outrage after Chinese security guards beat and severely injured a South Korean photojournalist covering President Moon Jae-In's visit to Beijing. Opposition parties and internet users joined in, saying the incident epitomised the Asian giant's attitude towards its smaller neighbor. Two Conservative senators’ business venture linked to China: Two Conservative senators – one with close ties to Beijing – set up a private consulting business this year with partners who are involved in attracting investment from China to Newfoundland and Labrador, corporate records show. Senator Victor Oh, who recently said he has not conducted any "personal business" in Canada or China since his appointment to the Red Chamber in 2013, formed a St. John's-based company in April with Senator David Wells. Mr. Wells would not say whether Signal Hill Management is pursuing business deals with China-based entities. J-Alert: One of Japan's Japan’s most popular phrases is the system used to warn citizens of an imminent missile attack. US offers 'proof' missile fired at Saudi Arabia was Iranian: AFP reports, the United States on Thursday presented pieces of what it said is the missile fired at Saudi Arabia by Houthi militia in Yemen, describing it as conclusive evidence of Iran involvement and its violation of UN resolutions. EU gives UK go-ahead for next phase of Brexit talks: FT reports, negotiations to start on trade after leaders endorse progress on the divorce settlement. Theresa May, navigating Brexit, reaches a first finish line: NYT reports, Ms. May lacks many of the qualities that draw a person into politics. She does not enjoy the public spotlight, or have a vision she yearns to share with the country. In a political environment that demands social ease and boundless intellectual confidence — the “tranquil consciousness of effortless superiority” once attributed to Oxford’s Balliol College by one of its famous alumni — she is formal, controlled and extremely private. “In some ways, she’s old-fashioned English in an era where being old-fashioned and English is no longer acceptable,” said Philip Cowley, a political scientist at Queen Mary University of London. Some Canada firms could move to US amid NAFTA worries: Reuters reports, more a quarter of Canadian firms could move part of their operations to the United States amid uncertainty over the future of the NAFTA trade pact, the nation's export credit agency said on Friday. Mexico plots open trade course to escape Trump's NAFTA threats: Reuters reports, Trump’s ‘America First’ brand of economic nationalism is pushing Mexico to seek sanctuary in more open commercial ties elsewhere to soften the blow of a possible breakdown of the North American Free Trade Agreement (NAFTA). "Mexico has lobbied hard to defend NAFTA. The country is heavily dependent on U.S. demand, which soaks up around 80 percent of its goods exports." Mexico scores big tourism gains after hurricanes devastate Caribbean islands: LAT reports, from October 2017 through March 2018, airlines cut more than 1.2 million seats to Puerto Rico, the US Virgin Islands, Cuba and St. Martin. In that same period, they've added more than 600,000 seats on flights to popular Mexican destinations. 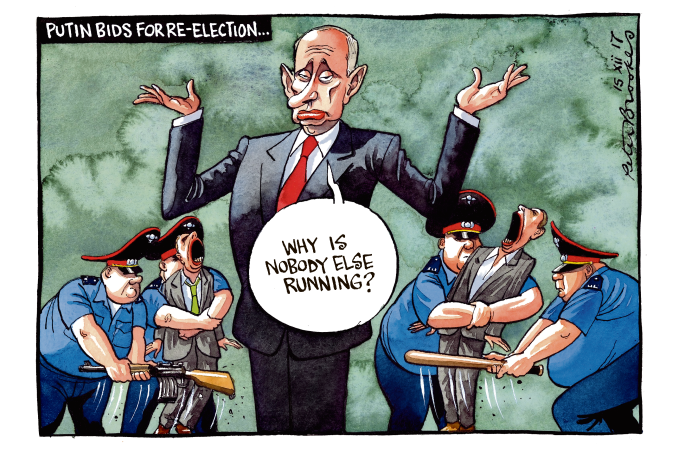 I wonder if the Trumpster will join Putin on the hustings? Tax reform: Republicans expect to unveil the final version of their $1.5 trillion tax measure today. "Voters who disapprove of Trump have reliably cast ballots against Republican candidates in each of the three major elections this year: In Alabama, 93 percent of those who disapproved of Trump voted for Jones; in Virginia, 87 percent voted for Gillespie’s Democratic opponent, Ralph Northam." "Among those 65 years old (and older), Moore won by 19 points. Among all other voters -- aged 18-64 -- he lost by eight." Paul Ryan sees his wild Washington journey coming to an end: Politico reports, he felt he was ‘made for this moment.’ But now, on the verge of achieving his long-sought legislative dream, he’s got his eyes on the exits. Paul D. Ryan exiting as speaker? It only makes sense. "Trump has already turned Senate Majority Leader Mitch McConnell (R-KY) into a pariah with a newly imperiled majority, and it seems only a matter of time before the House's failure to meet Trump's expectations causes him to truly turn his fire on Ryan too." Net Neutrality: The FCC voted to dismantle rules governing how internet-service providers treat traffic, a move that is likely to empower cable and wireless providers. "It is the first public confirmation by the Department of Justice of a federal inquiry into the San Francisco-based ride-hailing company." Nordic Choice Hotels tests blockchain distribution for Stockholm property: Skift reports, hotels, like airlines, currently rely on the global distribution systems and other intermediaries for distribution. Bypassing them could be an attractive proposition if it would lower costs. Google’s return to China foretells a global race to deliver AI: MIT Tech Review reports, with a new research center in Beijing, Google hopes to strengthen its global position in offering AI services through the cloud. Transneft says its computers were used for mining cryptocurrency: Reuters reports, computers at Transneft have been used for the unauthorized manufacture, or "mining", of the cryptocurrency Monero, a vice-president of the Russian pipeline operator said. Disney-21st Century Fox deal ensures that the future of television and movie viewing is online. H&M shares slide after unexpected sales fall: FT reports, Swedish fashion retailer has been struggling with a shift to online shopping. Facebook invites HR pros to steal its sexual harassment policy. Breaking: Harry and Meghan to marry on May 19, 2018.